Session musicians are used to taking solos, taking charge and taking unformed ideas and making them into master recordings. Monday night at the Schermerhorn Symphony Center, some of the finest of those players did something unusual. They took bows. 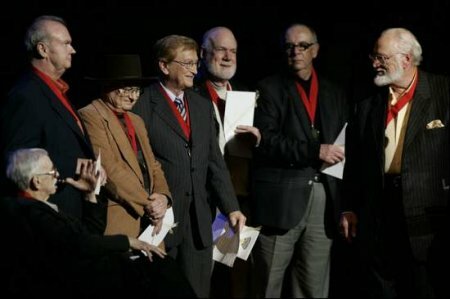 At the Musicians Hall of Fame & Museum's inaugural induction ceremony, six groups of musicians — men and women who played on many of the most important and well-loved records in the history of American popular music — were honored with medallions and applause. Motown group The Funk Brothers, Nashville's A Team, Los Angeles' The Wrecking Crew, Johnny Cash's Tennessee Two and Elvis Presley's Blue Moon Boys made up the first Musicians Hall class. 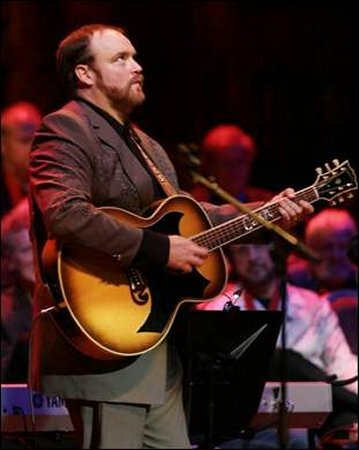 "We're usually the unseen people," said Nashville-based guitarist Reggie Young, who was inducted as one of The Memphis Boys, who played on Elvis Presley's "Suspicious Minds," Neil Diamond's "Sweet Caroline," Dusty Springfield's "Son of a Preacher Man" and hundreds of other notable recordings. "Everybody heard us on records, but they had no idea what we looked like. Of course, most of us were very pleased about that." Young, Gene Chrisman, Bobby Emmons, Mike Leech and Bobby Wood performed at the ceremony; Ed Kollis was also inducted with the group. 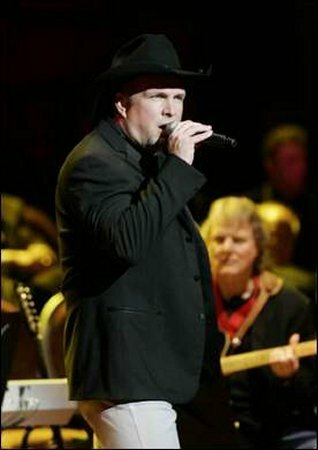 Garth Brooks said his performance with The Memphis Boys of Presley's "Suspicious Minds" made him more nervous than he'd been onstage in years. "This one is all about the music itself, and the people who make it. The things these people played are as well known as the artists they made famous." Throughout the evening, vocalists took the stage to sing the songs recorded by the new Hall of Famers. Brooks, George Jones, Peter Frampton, Vince Gill, Amy Grant, Roger McGuinn, Rodney Crowell, Mary Wilson of The Supremes, Dobie Gray, B.J. Thomas, Keith Anderson and Mandy Barnett all sang in honor of the musicians. "These are the people you're listening to when you hear the records, but too often they're not acknowledged," Wilson said. " … These people put so much feeling into what they played." 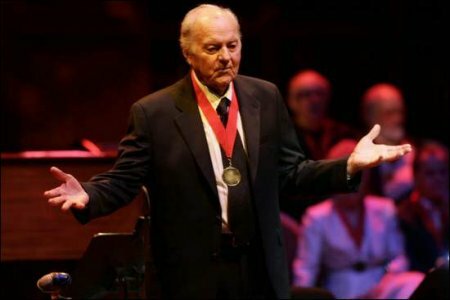 The show, for which Creed Bratton of TV's The Office served as host, drew frequent standing ovations. "There's been nothing like this before," said Blue Moon Boys drummer D.J. Fontana. Amy Grant, who sang "These Boots Were Made For Walking" with The Memphis Boys, looked around the room at a pre-show reception and said, "I think my whole record collection is in this building." For the purposes of the induction, The A Team is identified as Harold Bradley, Floyd Cramer, Pete Drake, Ray Edenton, Hank Garland, Buddy Harmon, Tommy Jackson, Grady Martin, Charlie McCoy, Bob Moore, Boots Randolph, Hargus (Pig) Robbins and Jerry Kennedy. 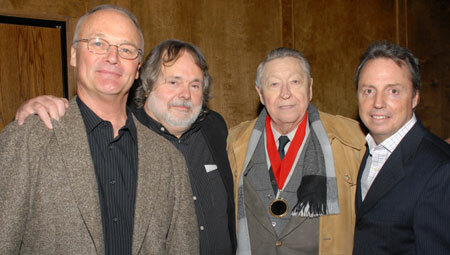 Those players helped define "The Nashville Sound" on more than 130,000 recordings. Brenda Lee hugged each living player in that ensemble and said, "We couldn't have made those records without these musicians." The Wrecking Crew created the core sound for records by Sonny and Cher, Ricky Nelson, The Beach Boys, The Byrds, The Mamas and the Papas and others. 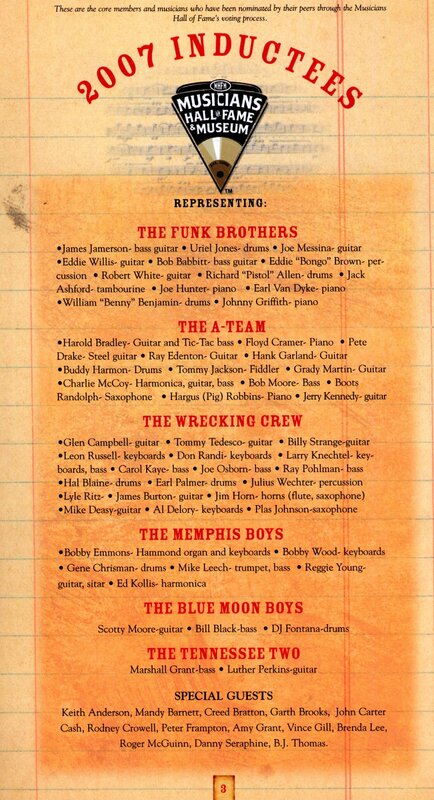 Nashvillians Billy Strange, Jim Horn and Al Delory were part of the Crew, as were Glen Campbell, Tommy Tedesco, Leon Russell, Don Randi, Larry Knechtel, Carol Kaye, Joe Osborn, Ray Pohlman, Hal Blaine, Earl Palmer, Julius Wechter, Lyle Ritz, James Burton, Mike Deasy and Plas Johnson. 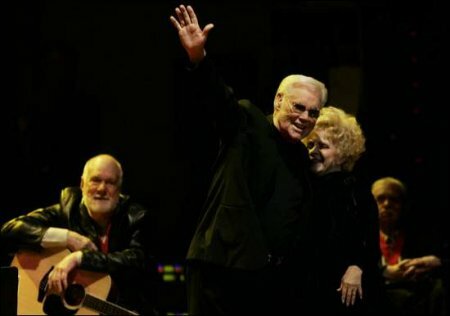 "It's so nice to get back together with these people," said Burton, whose guitar style has influenced generations of players who first heard him on records by Ricky Nelson, Emmylou Harris, Elvis Presley and others. Backstage, Burton posed for photos with Scotty Moore, the man who created the basic rock guitar style in a July 1954 Sun Records session with Presley. 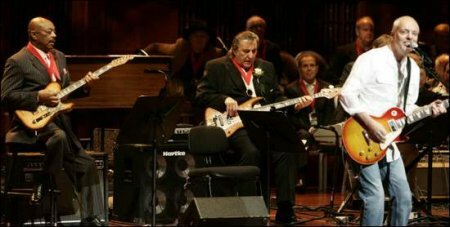 Moore is the only living man to have been at that seminal session: Presley, bass man Bill Black and producer Sam Phillips are all gone. 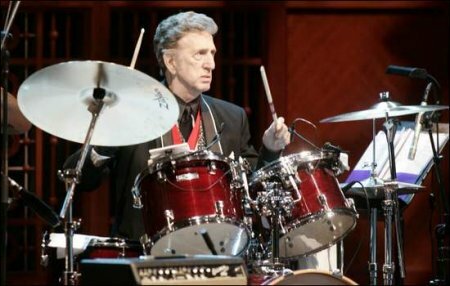 Moore went into the Hall with drummer Fontana, who joined the band in 1955 and played on more than 450 of the King's cuts. Cash's Tennessee Two was made up of Marshall Grant on bass and Luther Perkins on guitar. 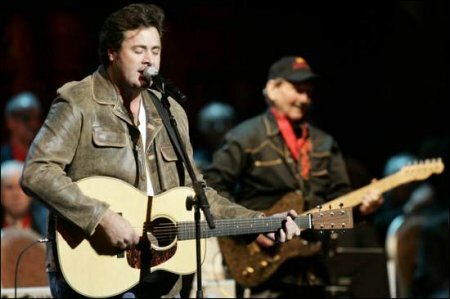 Grant stood onstage Monday night and played bass while Cash's son, John Carter Cash, strummed an acoustic guitar and worked to re-create the glorious, primitive early Cash sound. "It was a sound created out of inexperience and out of circumstance, but most of all it was a sound created out of joy," Cash said. The Funk Brothers backed Stevie Wonder, Marvin Gaye, Diana Ross and every other important Motown artist. 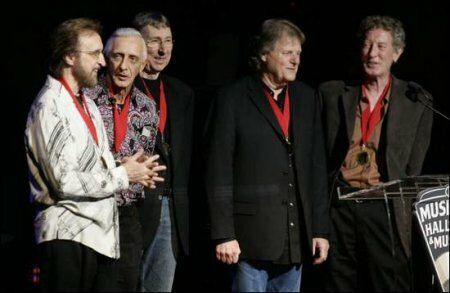 Nashville's Bob Babbitt joined Brothers drummer Uriel Jones and guitarist Eddie Willis in representing the band, which also included James Jamerson, Joe Messina, Eddie "Bongo" Brown, Robert White, Richard "Pistol" Allen, Jack Ashford, Joe Hunter, Earl Van Dyke, William "Benny" Benjamin and Johnny Griffith. 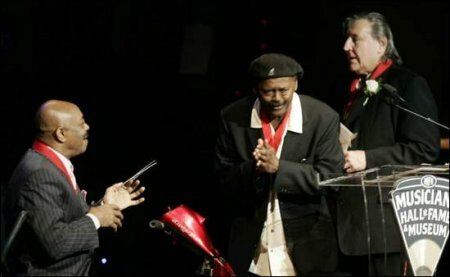 Before the show, Willis surveyed the scene and said he felt a commonality with his fellow inductees. "This is like a family reunion, with family you've never even met before," he said. Joe Chambers opened the Musicians Hall of Fame & Museum in June, ensuring that Nashville would have an unprecedented building full of memorabilia and information about those previously "unseen people." "It's been a journey," Chambers said. "There was nothing, and now there's something. 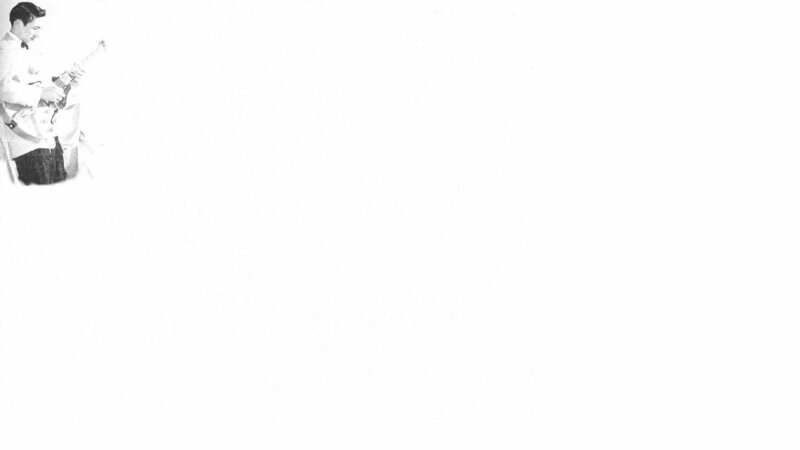 I mean, this really is something." 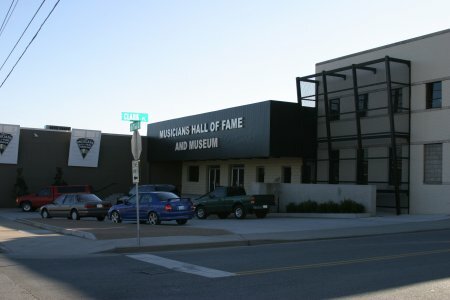 The Musicians Hall of Fame and Museum opened to the public June 9, 2006 and is the only one in the world. 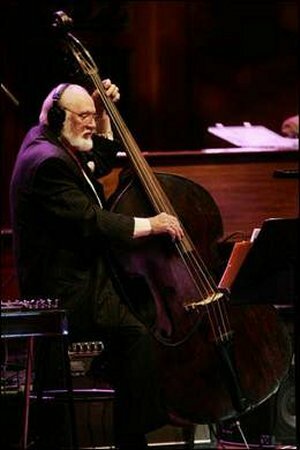 It honors great musicians of all genres regardless of instrument played. 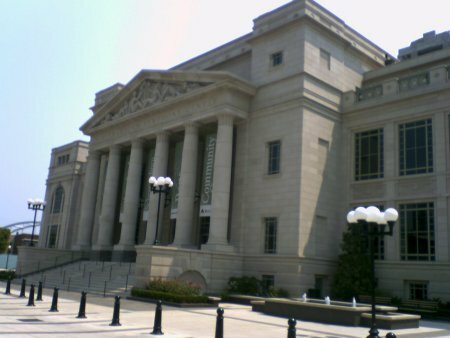 The museum consists of many historic instruments played on countless of famous recordings from the Red Hot Chili Peppers, Bob Dylan, all of the Beatles individually, and to Hank Sr., George Jones and Garth Brooks. The complex also houses a school of music and a performance hall. I know I'm leaving a lot of stuff out.... It was a night to remember and I wish you could have been there. 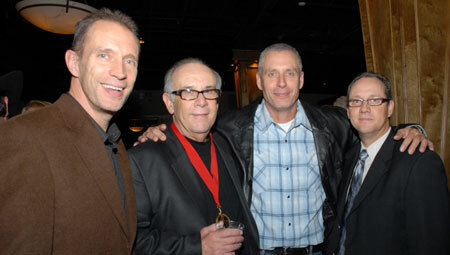 BMI proudly sponsored the after party for the inaugural Musicians Hall of Fame induction ceremony held Monday, November 26 in Nashville. 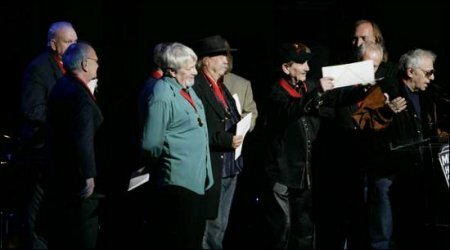 After honoring the members of the A Team, the Blue Moon Boys, The Tennessee Two, the Funk Brothers, The Memphis Boys and the Wrecking Crew at the Schermerhorn Symphony Center, the revelers moved to the Musicians Hall of Fame to continue the celebration. Nashville A Teamer Jerry Kennedy was one of the night's inductees. Music runs wild through the Kennedy bloodline: All of Jerry's three sons are hit songwriters, while Shelby Kennedy is also a Writer/Publisher Relations representative in the Nashville office. 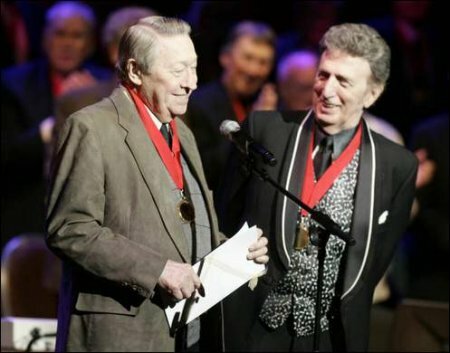 The vast majority of 2007's inductees are BMI affiliates, veterans and virtual architects of the American popular music canon. Nashville's A Team lent their gifts to studio recordings by Patsy Cline, Jim Reeves, Elvis Presley, Bob Dylan, Brenda Lee, Marty Robbins and countless others. The Blue Moon Boys and the Tennessee Two helped shape the sounds of Elvis Presley and Johnny Cash, respectively. The Wrecking Crew's musicianship finessed legendary singles for The Ronettes, The Beach Boys, Simon & Garfunkel, The Carpenters and more. Detroit's Funk Brothers were a tour de force in Motown, playing on Marvin Gaye's "I Heard It through the Grapevine," singles by Smokey Robison & The Miracles and a smorgasbord of others. 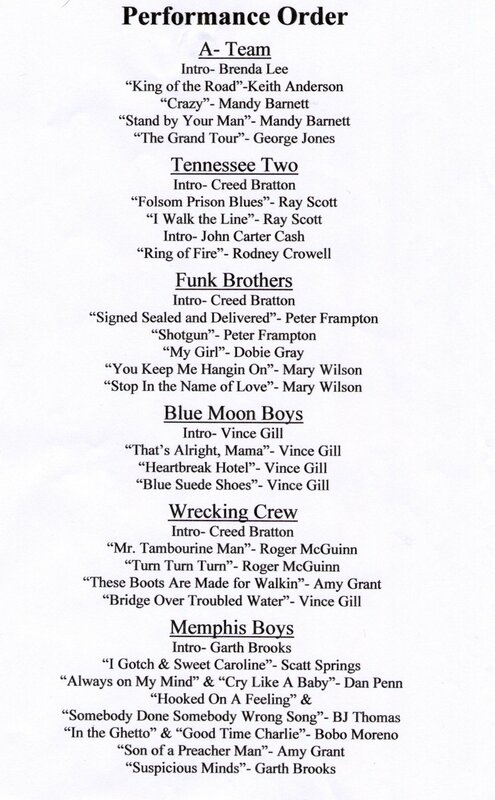 The Memphis Boys picked, strummed and drummed through major hits for icons including Elvis Presley and Willie Nelson. Joe Chambers, gatekeeper of the Musicians Hall of Fame, took great care in organizing the event, which brought due recognition to behind the scenes virtuosos. 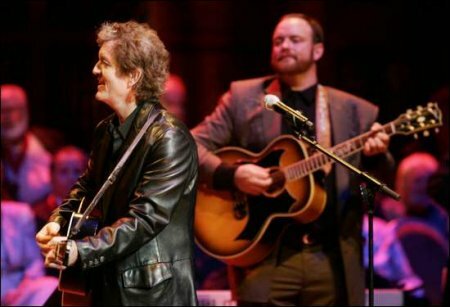 Peter Frampton, Vince Gill, George Jones, Brenda Lee, Mandy Barnett, The Jordanaires, Dobie Gray, The Supremes' Mary Wilson, Amy Grant, Keith Anderson, Ray Scott, Garth Brooks, John Carter Cash and Rodney Crowell presented, performed and reiterated glowing praise. Actor/musician Creed Bratton, beloved character of the same name on The Office, proved an able host; before gaining attention for his television and film work, Batton played guitar in popular 60s group The Grass Roots.